Mary Davies has a nice job at an engineering firm that she joined as a startup. But recent management changes have made work difficult, and the presence of a certain handsome consultant has jumbled her feelings. When her former best friend, Isabel, offers her a two-week paid vacation in England, she reluctantly agrees. Maybe the time away will help her figure out what to do. Isabel is an Austen expert determined to finish her doctoral thesis, so this vacation will involve period costumes in a historic mansion. But when Isabel loses her memory and believes she’s actually living in the past, Mary’s stay becomes complicated. Isabel’s secrets suddenly all come to light, making Mary realize how little she really knows her friend. And when they involve the man she’s come to regard as important in her life, she doesn’t know what to think. Those who are unfamiliar with Jane Austen’s works may find some of the role-playing conversations a bit confusing, but since these are not the basis for the story, they won’t interfere with the reader’s enjoyment. In fact, this book might trigger an interest in picking up one of the Austen classics mentioned. I highly recommend The Austen Escape as a pleasant and engaging read. Valentine March has been forced to find employment after her father’s death. As a lady’s companion required to dress in drab clothes, she accompanies her employer to a notorious house party. She has no intention of encountering any of the eligible bachelors there, so she’s surprised when a gentleman finds her alone in the quiet place she’s managed to escape to, and converses with her. Tristan Sinclair, Viscount St. Ashton, has never had any interest in a long-term relationship with the ladies who’ve come and gone in his life. Although somewhat reformed from his younger days, he is skeptical of marriage and reluctant to settle down. But when he encounters Valentine, something stirs within him. One moment of indiscretion changes everything, and now they must consider how they will handle their newfound relationship. Can Tristan show her that he’s not the scoundrel she thinks he is? And will Valentine allow him to be a part of her life, knowing she has secrets of her own that may come to light? The Viscount and the Vicar’s Daughter is a delightfully clean romance. As both parties face their pasts, they attempt to trust and allow each other into their lives. I enjoyed seeing these two interesting characters grow in their relationship together. Highly recommended! Summer is working as a nanny for a couple vacationing in Belize. When their oldest son, Bray, arrives, Summer takes an instant dislike to him. Bray is a college party guy, and Summer is a conservative and modest girl. Their values are far too different. When a violent storm strands them alone together on a remote island, they’re forced to get along in order to survive. Both discover hidden depths in each other as they work through challenges in finding food, water and shelter. As the weeks progress, they find themselves falling in love. Being a teen romance, Summer by Summer is full of drama and physical attraction between Bray and Summer. Since their whirlwind romance takes place over a mere month, there is little substance to their relationship. Summer’s faith in God and a purity promise hold them back from taking things too far, but Bray has no such restrictions, other than his respect for Summer. Maybe I’m just a little too old for teen romances, or maybe the drama in this book is a bit too much. But although this is a fast and engaging read, the story left me feeling unsettled at the end. Summer and Bray are both too immature to be making a lifetime commitment. In this sequel to Doon, Kenna has returned to her life in the theater, and now she’s missing the prince she left behind. She has only now realized that they had a true Calling, and Duncan is her soul mate. So when he suddenly arrives to bring her back to Doon, she heads back willingly, hoping for another chance. But Duncan is harboring illusions that Kenna is already spoken for, and won’t listen to any explanations. Meanwhile, Veronica is attempting to stop the witch’s evil spell, which has created a zombie fungus that threatens to overtake Doon. She and Kenna have defeated the witch once before, and she needs her best friend’s help once again. Can Kenna help Vee save Doon, and can she salvage the relationship she once had with Duncan, before time runs out? Filled with drama and suspense, Destined for Doon picks up right where Doon left off. Complicated relationships take center stage, as both Vee and Kenna struggle to make things right with their Doonian princes. And of course, good must triumph over evil. My one complaint about this story is that it ends in a cliff-hanger that felt completely out of place. But otherwise, this is a great read. Sylvester, Duke of Salford, has decided it’s time to marry. After consulting with his godmother, Lady Ingham, he reluctantly agrees to meet her granddaughter, Phoebe Marlow, to determine if she might be a suitable match. But Phoebe is horrified when she learns of his intentions, since she intensely dislikes him, and has cast him as the villain in her soon to be published novel. When Sylvester and Phoebe suddenly find themselves stranded in a small country inn for a few days, they get to know each other better and question their initial impressions. But as circumstances unravel around them, their relationship goes from bad to worse. Is it possible that they both could be so wrong about the other? 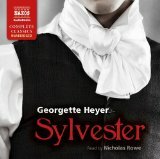 Listening to Nicholas Rowe’s rendition of Sylvester is an absolute delight. Since the text is heavy on dialog, it reads more like a play than a book, and it is easy to immerse oneself fully in the story. Many scenes are laugh-out-loud funny, and the characters are well-developed and even comical in their actions. I absolutely adored Sylvester, and Phoebe is a spunky girl with a good heart. Anyone who enjoys a good, clean romance will love this book.